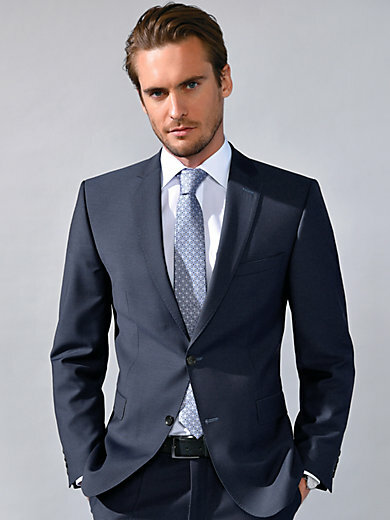 Sports jacket by CARL GROSS with 1 breast welt pocket, 2 flap pockets and side slits. Numerous inner pockets. Made from the finest material with a modern “Pin Point” texture from the superior Italian weaver MARZOTTO. The use of ultrafine yarn and a very special weave means the fabric is suitable for both the summer and winter as well as extremely crease-resistant, breathable and soft to the touch. The finest details, first-rate workmanship and materials allow the traditional craftsmanship and exquisite tailoring to be clearly discerned. 100% new milled wool. Lining in 51% viscose, 49% acetate. Length approx. 75cm/30ins. Dry clean recommended.